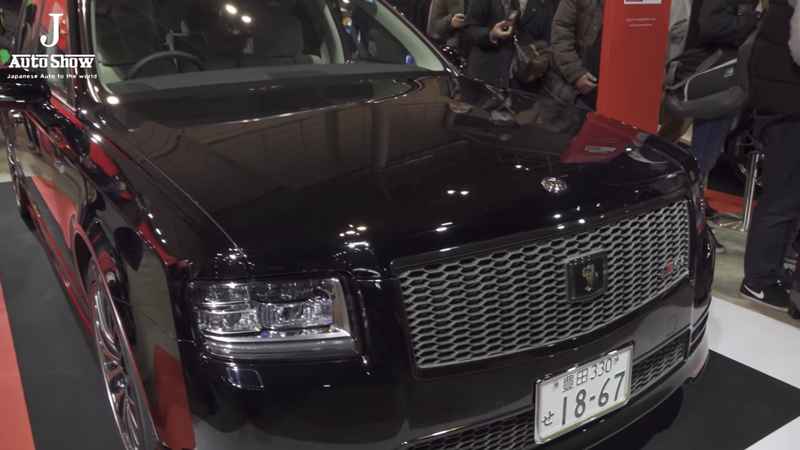 A couple of weeks ago, the CEO of Toyota showed up to a track event in his custom pearl white Toyota Century GRMN, which is Toyota’s beautiful limousine extruded through a Gazoo Racing filter. It was believed to be a one-off until a second Century GRMN, painted black this time, showed up to the Tokyo Auto Salon. For now, not much more is known about the Century GRMN beyond its looks from its multiple public appearances. It’s a clear favorite of Toyota CEO Akio Toyoda, and both the white and black cars share a license plate reading “18-67,” a reference to the 1867 birth year of Toyoda’s great-grandfather and Toyota founder Sakichi Toyoda. As we mentioned with the latest public outing of the white car, it’s unclear if there are any actual performance modifications to the cars over the Century’s regular hybrid V8 that makes 376 horsepower. It’s odd that Toyota’s Japanese Instagram account has posted its other cars from the Tokyo Auto Salon, but not this one. It’s possible that Toyota is teasing this pair of sportified luxury limos as a way of gauging interest in making a production run. Or perhaps they’re strictly for business use by Mr. Toyoda. Maybe he treats them like tuxedos—a formal white and a casual black.